Available in a 6# block. Use in sandwiches, Panini, pizzas, baked pastas, mac n cheese, sauces, fondue, warm dips and spreads. 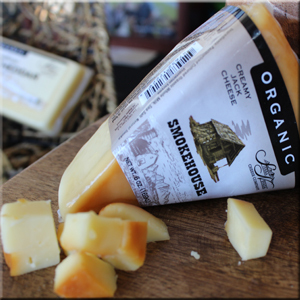 Smokehouse Jack is a great cheese to use to compliment other wood grilled/roasted items. Ben Gregerson and John Dunden of Sierra Nevada Cheese Company first introduced their cheese products to various local farmers markets. Market demand increased quickly, and soon their cheeses were sought out by local retail stores. In 2003, the company's successful growth allowed them to relocate their creamery 100 miles north of Sacramento to Willows, California, where they are located today.